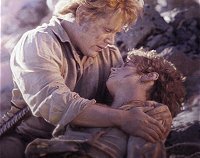 Peter Jackson concludes his ambitious three-film Lord of the Rings epic with one of the most astonishingly powerful action-adventure movies ever made. Not only does Jackson meet impossibly-high expectations, but he uses inventiveness and passion to add texture and emotional energy to an already rich story. The Fellowship is now in two camps: While Frodo and Sam (Wood and Astin) travel into Mordor with the slimy Gollum (Serkis), a massive battle is brewing in the kingless land of Gondor. This'll require all the strength and creativity of the wizard Gandalf (McKellen), reluctant monarch Aragorn (Mortensen), elf warrior Legolas (Bloom), feisty dwarf Gimli (Rhys-Davies) and surprisingly brave Hobbits Pippin and Merry (Boyd and Monaghan). And they'll have to work with a troubled king (Hill) and his tenacious niece and nephew (Otto and Urban), as well as a bereaved leader (Noble) and his frustrated son (Wenham). Can Frodo and Sam destroy the powerful ring before the evil Lord Sauron kills every living thing in Middle-Earth? This film keeps us gasping from start to end! It's so impeccably and artfully done that we can hardly breathe, immobilised by emotion, suspense, the sheer spectacle, the intimate drama. Each character is pushed to the brink (some of them beyond it) by a script that never takes the obvious road; sticking closely to Tolkien's story helps, but there's an artistry in the writing that makes this more cinematic than literary. Each performer soars with it, showing us the blood, sweat and mental anguish at every stage, including moments of humour and joy that continually surprise them (and us). Wood and Astin will forever be a double-act after the gruelling voyage Frodo and Sam take to the fires of Mt Doom. Mortensen creates a gorgeous arc over the three films from hesitant to warrior to ruler--we not only believe this transformation, we feel it! Boyd and Monaghan prove that they're capable of much, much more than being a comic double act. Serkis gets to appear on screen as Smeagol in a prologue, then goes even further as Gollum later. And McKellen continues to add spark and soul with his perfect blending of wit and gravitas. Jackson juggles all of this with remarkable skill--technically this is a triumph from the expert music and production design to the nearly seamless effects. And scenes of quiet intimacy are staged with the same care as the mammoth battle sequences, which keep shifting gears and escalating until we are nearly overwhelmed ... and yet they're always coherent and meaningful. The themes are so resonant that they hit us deeply, as do the interpersonal dramas among the characters. The idea that even the tiniest people can change the world, as long as they work together, is pure inspiration. Quite simply, we never want the film to end! And for a while we think it might not, as Jackson wedges in several codas, epilogues, false conclusions and postscripts, most of which are a little too sweet after the raging power of the story's devastating climax. But they also let us say farewell to characters in just three years that have secured a place both in movie history and in our hearts.